Today is a small milestone in this yearlong journey of making pies. Yes, there are still many pies ahead of me but it feels like a good time to pause for a moment and take an assessment. If you were to ask me what I have learned so far, I would tell you that I have found that the simple act of giving someone a pie can have profound consequences. Many times, though not always, I have felt that I have been in the absolute right place at the right time. For example, I brought someone a quiche only to find out that they were incredibly busy that day and had not had time to even think about dinner. And there have been a number of times when I’ve brought a pie to someone and was able to make a not so good day seem a bit brighter. I will admit that this is not a project that make sense to everyone. One friend saw me preparing to deliver my pie and said rather dryly, “Go on…. you go make someone’s day.” I left the house feeling a bit put off by his comment. What was he trying to say? Later, when I was leaving the house of that day’s pie recipient, she said, “You know Karen, you really made my day.” How about that. I was able to make someone’s day by bringing them a pie! My friend Debbie told me that this is probably the best possible project for me – because I love to bake and I love to share stories about the people who have touched my life. 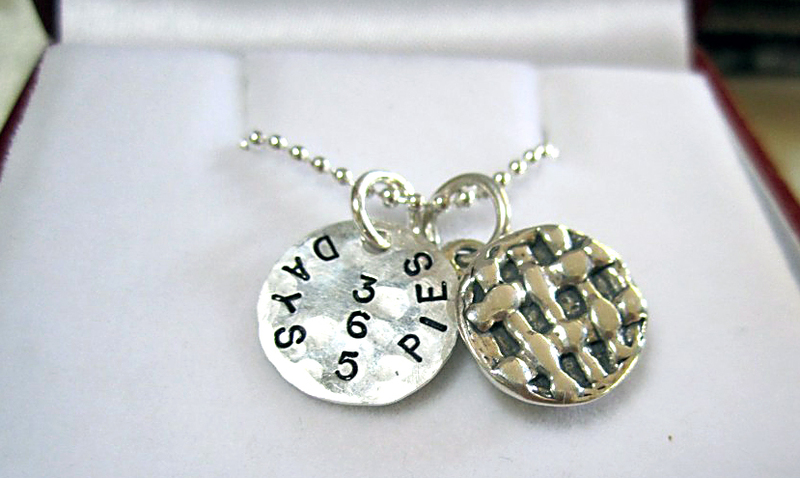 If you think about it, this pie adventure is composed of many different threads. And as the threads come together they create a tapestry that tells the story of my life. I am truly blessed – and very lucky that I am able to give thanks to those who have helped me along the way. 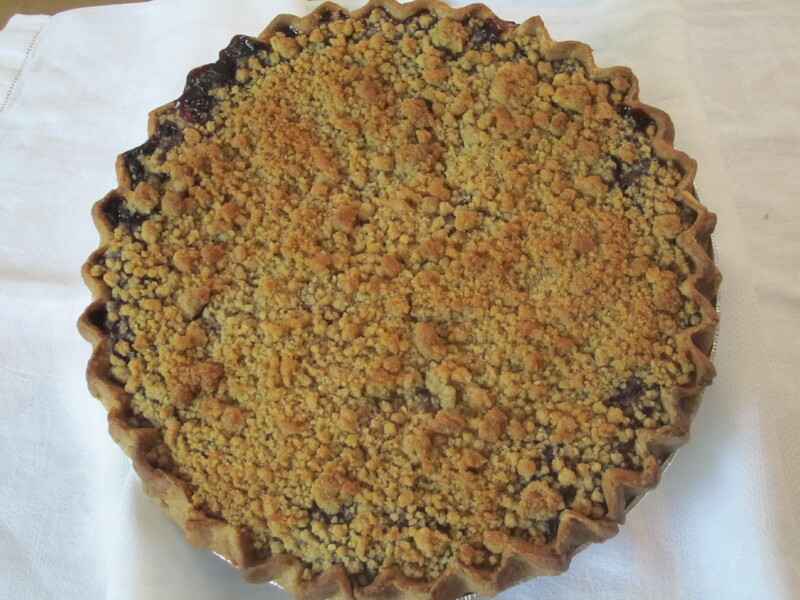 Today, I brought a Marionberry Pie to Debbie at Southern Oregon University. She is my neighbor, but she has also been a tremendous resource for my family as we have navigated the maze of financial aid for college. And Debbie was the first person who “suspected” that a pie was awaiting her. Seems this “project” is not as secret as I thought! As I continue on this journey, I am buoyed by the encouragement and support that has been shown by my friends. 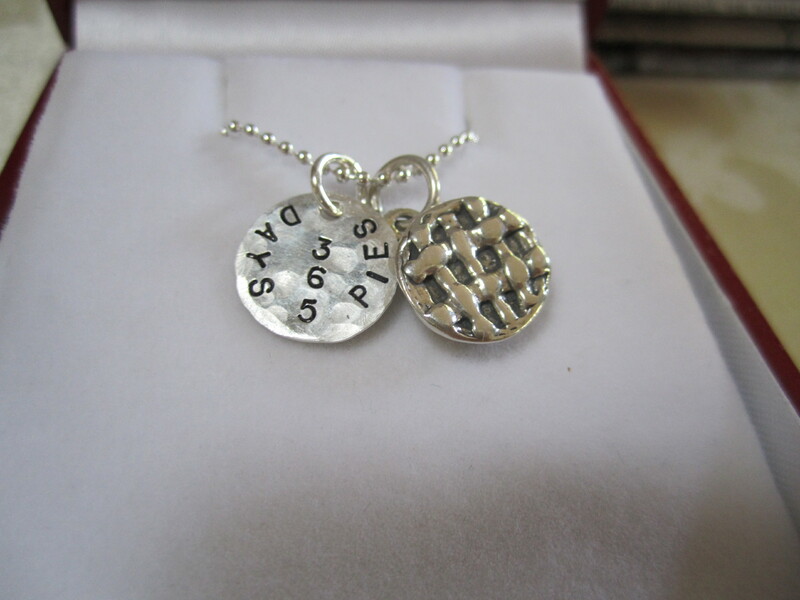 Below is an example of this support – a necklace that my friend Pam had made especially for me. Such a lovely gift. Didn’t I say that I was blessed?